Home Cool stuff LED Kitchen Backsplash is Epic Coolness! Today while wading through Facebook I actually got a suggested page recommendation that was super cool! 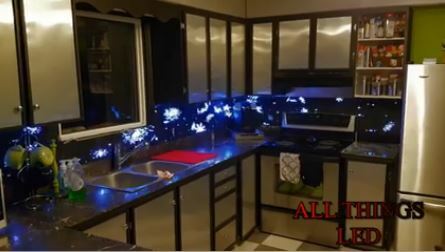 All Things LED had a custom LED kitchen backsplash that has limited possibilities! For me I could run constant reminders to the kid to put away anything they drug out of the refrigerator or to clean up your mess! Think of possible add on sales. A motion detector with face recognition so you could Taylor a message specifically for the person entering the kitchen! Talk about creepy right? All Things LED says that this backsplash demo has an introductory prie of $149.99 per sq ft Canadian which would make this $113.00 US at todays exchange rate. Pretty darn cool I must say! Anyone else want? Marvel Studios’ “Avengers: Infinity War” Trailer Released! That big robot fight we all heard about… Just happened! Drone Lithium Battery Almost Burns House Down! Hook me up, I love that. Hope it comes with a warranty and support. Gents looks like you can go to http://allthingsled.ca/kitchen-back-splash/ and email with measurements to get pricing. My family doesn’t need to eat tonight–BREAKOUT!